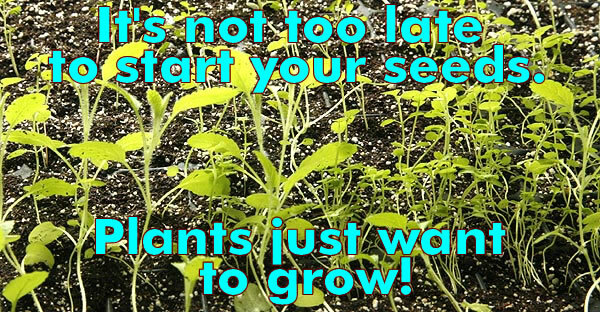 It’s Not To Late To Start Your Seeds. There is plenty of time for your plants to grow. Spring is finally here, and if you are like most people now is when you realize its time to start your seeds. No its not too late even if your well organized friends had their seeds all sown and growing starting back in February there is still plenty of time for you to catch up. Starting seeds in early May is pretty common, and if you want to start them by direct sowing then this is the perfect time to buy your seeds. Depending on where you live early spring may still be on the horizon so don’t worry about being late. Seeds are just happy to grow, if you start them later than your friends they don’t care. As long as you look after them and they get to grow its all good with the seeds. I always felt somewhat envious of those who were so organized that they has their seeds all sown by mid February. Before we bought our first farm I was always late getting the seeds in. In the end though I still got good plants, pretty flowers and good vegetables, maybe some flowered a little later than my organized friends but in the end it all seemed about the same. Now we have a farm I have to get seeds started early but that does not mean that all seeds get started at the right time. There are many reasons to start seeds later. 1. Life. It tends to go on around you keep you busy until suddenly, wow its spring, and we really need to get these seeds in now! This I suspect is the main reason most people don’t get their seeds in early, there is just too much else calling for attention. 2. Suddenly you realize you need more seeds that you sowed. It often happens. You think you only need 6 tomatoes then find you need 12 more seeds to sow. 3. Something was forgotten. Despite all the good planning, the lists, the checking somehow a species were totally overlooked and did not get seeded. Now there is a frantic rush to get the seeds sown. This happens more often than you would think even with professionals. 4. Some seeds come up really fast. Planting things like marigolds in February would be a problem. The things germinate very quickly and grow fast. Therefore such plants don’t need a lot of lead time for indoor planting. While other plants take a long time to germinate or are very slow to grow and need more time, these fast growers can be left and seeded much later. 5. The first seeds planted did not come up. This can happen for many reasons. It may be they were planted too deep, not watered properly, got a fungal disease or that the seed was not in good condition when it was purchased. See How Are Your Seeds Cared For Before You Get Them? I still have this problem at times since to get new plants and varieties to offer to you I need to buy from overseas sources then grow them to be organic before I can offer them to you. Not all the seeds that we get have been treated very well and they don’t always germinate. (which is a real pain if you have waited 6 months to get the darn things). This is why I always recommend that if you have quite a few seeds don’t plant them all at once. Then if something does go wrong you have a second chance to get it right. 6. Seeds came up then died for some reason, perhaps they were over watered, under watered did not get enough light, the cat sat on them (it happens more often than you think). Now you have to start those seeds all over again. Try to figure out why they died and not repeat the process. Put netting or something around the seed trays to stop the cat jumping on them. If you had seeds and got up one morning to find all that was left were little stalks, check under and around the tray for a slug. They come up in the night and mow down little seedlings. 6. Other reasons, could be anything the world if full of stuff to do and seeds are just one of them. No matter what the reason there is always time to start more seeds. For some plants direct seeding is the best way to go anyway. Large seeds like beans, peas, okra, giant sunflowers are best direct sown as are things like Calendula and cilantro. Other plants need to be coddled a long time before they are put in the ground since they grow so slowly. No matter what time you start your seeds as long as you look after them then it’s the right time to start them. While its true that starting tomato seeds in August wont get you a crop starting them now will give you tomatoes later in the year than those who started early. If you eat a lot of some crops then starting seeds at different times makes sense anyway as it will space out your crop giving you more food or flowers for a longer period of time. So don’t be deterred by those who started early and tell you its too late now. Its not. Seeding now is a perfect time. We are still seeding and so should you. Garden in your own time. Be creative and do your own thing. 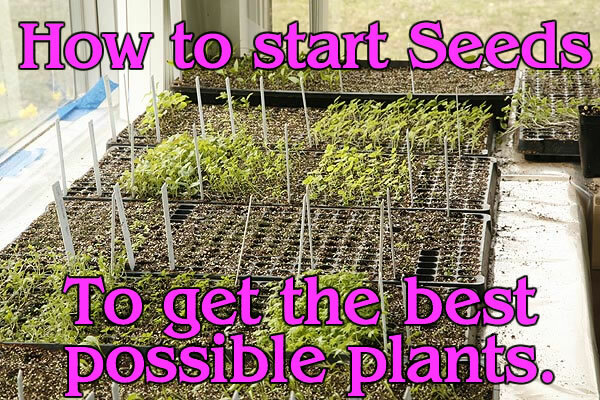 For details on how to start seeds see. It’s time to start your seeds. Author Janice Hazeldine PhDPosted on April 21, 2017 Categories Garden work, plants, things to doTags how to plant seeds, never to late to plant seeds, planting seeds, seeding your plants, starting seeds, time to start seeds, tips on planting seedsLeave a comment on It’s Not To Late To Start Your Seeds. Its Time To Start Your Seeds! How to start seeds to get the best possible plants. Getting a head start on winter is important when starting seeds. Most people dont realize just how soon they need to start them. IN most cases thats around the end of February to Early March. It may be later if you live in zone 5 or above and earlier if you live in zone 8 or more. Good seed companies will print important instructions about each seed on the seed packet. Excellent seed companies will send you an general instruction sheet and specific ones for seeds that need special care or treatment. Its very important to always read the instructions before you plant a seed. This way you wont be disappointed when the seed fails to come up. If you have a seed that needs light to germinate and you cover it then nothing is going to happen. If it needs soaking or roughing up first and you dont do this you may get some germination but not that much. If it needs stratifying and you dont carry this out then all you get is bare soil. So read the instructions before you start. Good seed companies let you know before you buy the seed if it needs special treatment so make sure you read any information on the website about how to grow the seeds before you buy it so you dont get a nasty shock when the instructions arrive. Preparing to plant your seeds. How the seed is treated is going to depend on several factors one of which is how large the seed is. Large seeds like beans, peas and such like will either need their own individual pot to start in or will be planted directly in the ground. Things like beans and peas do well sown directly other large seeds may need a little more help and need to be sown indoors first. Small to very tiny seeds will need extra care since handling them is a much tougher job. For this reason there are several different ways to grow seeds. Most people tend to grow all their seeds in flats. This can be fine but it has severe limitations. 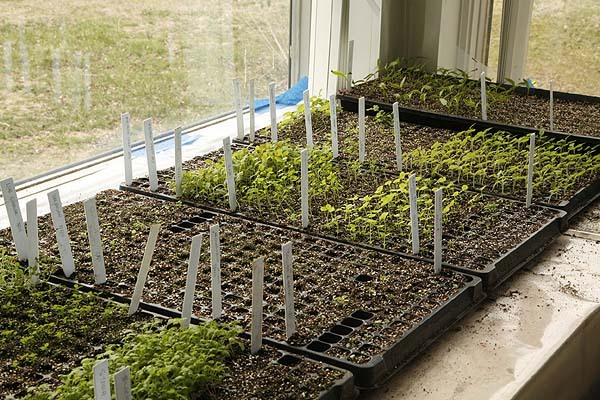 Its very hard to remove some of the seedlings without disturbing the others. 1. If some seeds have germinated and others have not yet done so then the ungerminated ones get massively disturbed when the germinated ones are removed. This means the others may now never germinate and your seed count just went way down. 2. New seedlings often the roots get all tangled around each other so its hard to separate one seedling from another. This damages either the roots or the stem of the little plant. Once the stem of the seedling has been snapped its a goner. There is nothing you can do to save it. Lots of plants are killed this way because separating them is such a problem. Small cell plug tray. This tray has 288 cells. Used for small to small-medium seeds. Using individual cell trays removes these problems. These trays are like flats but they are made up of small cells they are often called plug trays. Trays come in many different sizes so the correct size cell can be selected for different size seeds. Small cells can be used for tiny seeds and large cells for bigger seeds. 1. Each seed can have its own individual cell to grow in, or if the seeds are very tiny two or more per cell. 2. 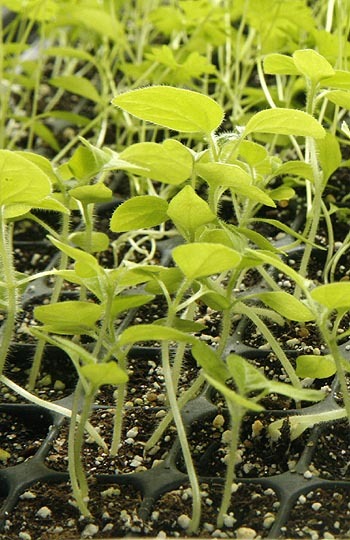 As seedlings grow they can be removed individually and potted on without disturbing the other seeds. 3. Lots of different seeds can be sown in the same tray without any problems with them getting mixed together. 4. trays are easy to work with and move around. 1. Cells dry out fairly quickly since there is only a small amount of soil in each one, especially in the tiny ones. This means that they need to be watered far more often. Cells at either end of the tray are very susceptible to drying out and its often best not to plant these end rows. Though they should be filled with seeding mix. When starting seeds its important to use a good seed starting compost, not any old compost and certainly not the soil you scraped up from your garden. Its important to give your seeds the best possible start in life. That means a soil that is devoid of any weed seeds which would certainly be in soil you scraped up outside. You need something that it is easy for them to grow in that holds water well, does not dry out too fast and has small enough particles that the little seeds dont have to fight around large clumps or small rocks to get to the surface and grow. Many places sell seeding compost. Look for one that has a balanced mix of components. You may need to try out several different ones before you find one that you like the best but then stick to that one. These are the really easy ones. If your seeds are the size of a pea then plant them in individual pots. Seeds this size dont need a really fine potting soil and regular potting soil can be used. Still dont use soil from outside as it will bring in weed seeds. There are two methods you can use. 3. Poke a small hole in the compost and drop the seed in, cover it. Dont plant too deeply! 1. Fill the pots less about soil. 4. water well and let pots drain. Personally I prefer the first method, I find it easier to do but its your choice. cells for larger seeds. Whatever receptacle you use it needs to be filled properly with seeding mix. 1. Spread the seeding mix over the tray and push it into each individual cell. The best way to do this is to pile a good layer of the material on top of the tray then get a identical tray and fit it on top to press the mix down into the cells. You may need to use two or more trays together if the trays you use are flimsy to get enough strength. Half filled seeding flat. Used identical tray to push seeding mix into the cells. Needs more mix and repeat. Once the mix is pressed down, add a second layer and repeat. Then its time to get in with your hands and make sure that the soil is really firmed down well. Fingers are always the best judge of how much mix is pushed down into the tray. 2. Water the mix. Using the spray option on your kitchen facet is ideal. Allow the trays to drain and the water to be fully taken up by the mix before you proceed. 3. Firm the soil down again. Often its very fluffy until its wet then suddenly you find there is very little soil in the cell or tray at all. If there is not enough soil then add more and re-water it. 4. Fill trays to within ( cm) of the top of each cell. 5. Plant the seeds. Seed details below. 6. Spread a light layer of soil over the top of the seeds. Before you do this make sure that the seeds you are planting dont need light to germinate if they do then leave this step out. Adding that top layer of soil. The best way to do this to ensure that you are not adding too much is to use a sieve. A simple metal one that can be purchased in any dollar store or market stand. Place the potting mix in the sieve then shake it gently over the seed tray like sifting flour. Cover the seeds in a fine gentle fluffy layer. This gives enough mix to cover the seeds without burying them too deeply that they cannot grow. After all in the wild they dont get buried in the ground they just have to hope that they get covered up a bit. So they dont want to be deep. Just lightly covered. 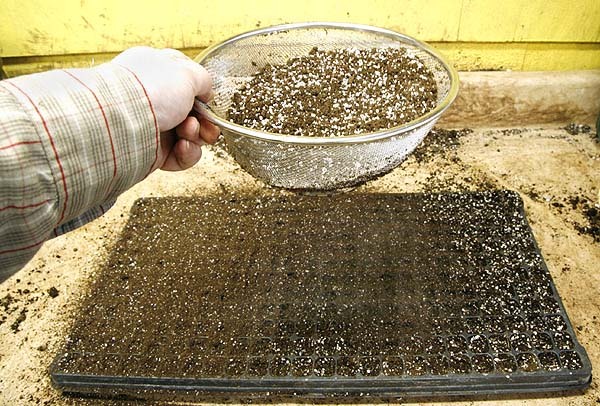 Use a sieve to shake a fine layer of seeding mix onto the top of seeds. This way they are not covered too deeply and you get a good even coating. If the seeds are large enough to handle then they can be moved one by one into the cells or placed in rows in your seed tray. In seed trays make sure they are well spaced. Plug trays use one cell per seed. If you have difficulty moving the seeds use a pair of flat ended tweezers to move the seeds around. These are an invaluable tool for any gardener who is seeding. 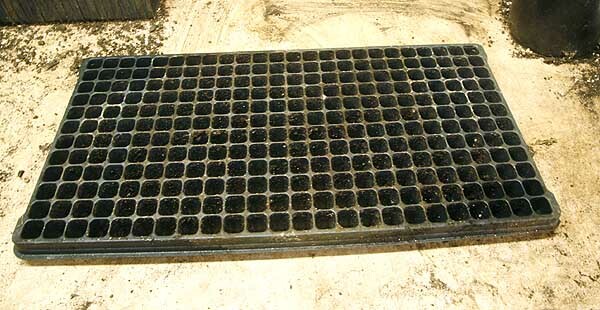 Trays with larger cells can be used for medium seeds. One or two seeds per cell. These Echinacea seeds are waiting to be covered. Use a stiff folded piece of paper. Seeds will line up in the fold and can easily be dropped exactly where you want them with just a gentle tap. If the seeds are large enough to see but too small to handle then the best way to seed them is with a piece of stiff paper. 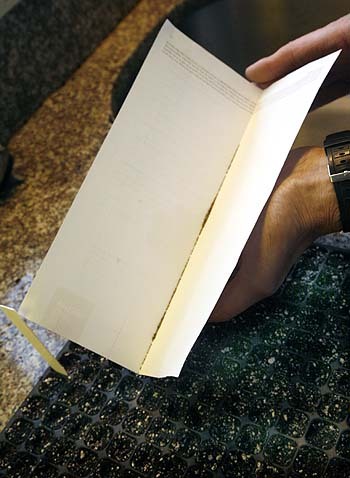 Take the rectangular paper and fold it down the middle in the long direction. Then tip some of the seeds into the crease in the center of the paper and shake gently. The seeds will line up in a row along the crease. If you then gently tap the paper the seeds will move out one by one and drop into the cells as you move the paper across the tray. This method is pretty accurate and only occasionally does more than one seed fall into a cell. The tweezers can then be used to move it if desired. It can take a few moments practice to get the angle of the paper and the amount of tapping required to move the seeds along one at a time but its a very useful technique and we seed all our trays using this method. Once seeds get to the almost dust like size its harder to use the paper method as they tend to clump together. Some people use the pinch method hoping that pinching and spreading like salt on food will distribute the seeds well but it can cause clumping. The best way to evenly distribute fine seed it is by using an old pepper shaker. Take a small portion of dry fine sand or loam – do not use beach sand unless you wash and dry it well first as the salt in the sand can affect the seedlings. Pick a sand or loam that is a different color from the seeding mix that you have chosen. Mix the seeds with a portion of the sand and place in the pepper shaker. Shake well to ensure an even distribution of the seed throughout the sand. Then shake the mixture out across the tray. The sand will ensure a more even distribution and you can see where you have shaken by the sand color. Make sure you buy a pepper shaker for this purpose dont use the one from the kitchen you wont get it clean again and the family will not be happy with you. Inexpensive shakers can often be found in dollar stores or market stalls. Planting more than one species in a single tray. 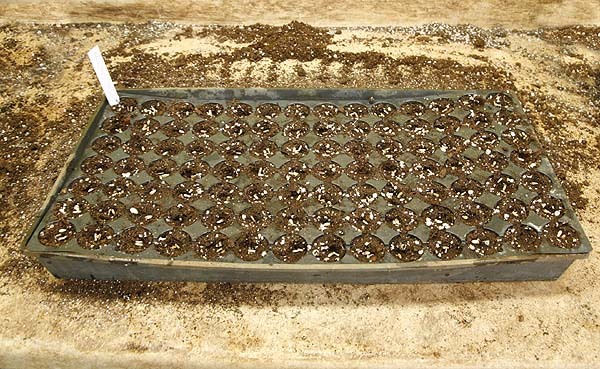 The advantage of plug tray is that you can plant a lot of different seeds in the same tray. This means you can save space if you only have a few seeds. 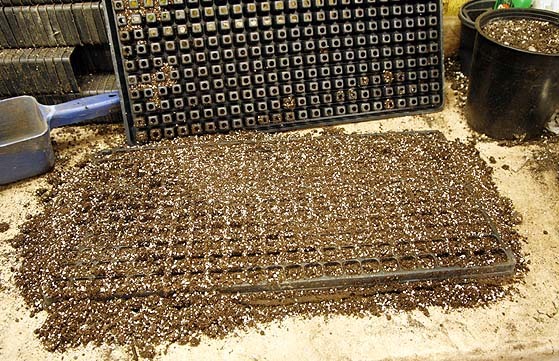 The small plug trays have 288 cells so thats a lot of seeds. However there are some factors to consider before doing this. 1.Plant the same size seeds in the same tray. Dont put larger seeds with smaller ones. The larger seeds will grow larger and faster and will shade out the small ones. This means that they may likely die. Plant all the same size seeds together. If using small plug trays it is often advisable to leave one row empty between each species to allow for them growing at different rates and reduce overshadowing. 2. If you have any experience with seeds or can find information on germination times then put all the seeds that germinate at the same rate together. If you have some seeds that germinate in 6 days next to some that dont come up for four weeks then the 6 day ones are going to be pretty big before the others even emerge. This will mean that they could easily be overshadowed for light and will not do anything like as well. Make sure you label your seeds! Using plastic plant labels is an excellent way to label seeds. This is especially important if you are planting more than one species in a tray, but even full trays should be labeled with the plant name and the date that it was seeded. This way you can monitor how long seeds take to germinate. Labeling is vitally important. It is surprising how easy it is to forget what you seeded and when especially if you are seeding many things at the same time. Always label your seeds so you dont have to guess what they are later. Water with a misting spray bottle or the mist setting on a hose nozzle. If you have a lot of seeds but dont want to use a hose pipe purchase a chemical spray bottle. They are sold in almost all garden stores for spraying chemicals on your plants during the summer months. Fill it with plain water and use it to spray your seedlings. Make sure you have one that is dedicated ONLY to this purpose. NEVER use a bottle that has been used for any other reason or you could quickly kill off your plants. These bottles are fairly inexpensive and come in anything from one to 5 gallon sizes. They are ideal for those with quite a few seed trays. This is the method we have used for many years on our farm. Use a spray bottle to mist seedlings once they are planted. 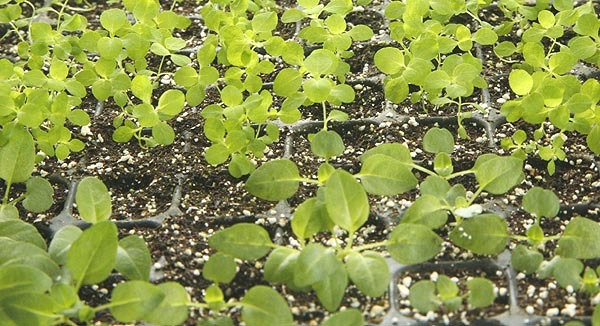 Seedlings will need to be sprayed at least once a day. If they are in the sunshine they may need more than this. 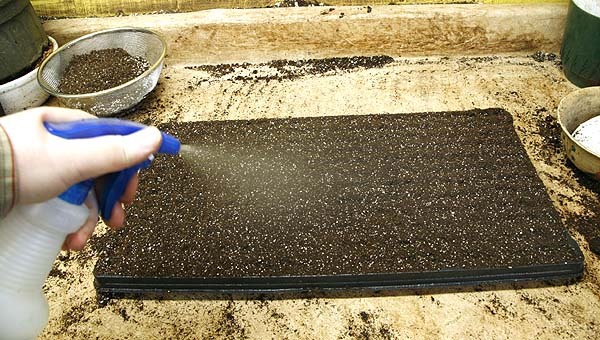 Small plug trays dry out very quickly so ensure that the seeding mix is always moist, not saturated wet but moist. We prefer to keep our seeds in open air not in a tent structure that some people recommend. This can often increase fungal growth and make the seeds very prone to damping off fungus. Once the seedlings are started to grow they will need more water so longer spraying sessions will be needed. When the seedlings reach about one inch high those in cell trays can often be watered using a thin spouted house plant watering can. The roots have bound the soil together enough to stop it floating away and they need more water. Using this method far more water can be delivered to each seedling than with the mist sprayer. Take care however if you have several different species of seeds planted in one tray. If the seeds are not all grown at the same rate then this method is unsuitable. Once the seedling have reached the second pair of leaf stage add some liquid fertilizer to the spray (or can). The amount of food in seed starting mix is very small and in individual cells it is used up very quickly. Extra feeding at this stage will ensure strong healthy seedlings. While only some seeds need light to germinate it best to put all the trays in lighted areas immediately they have been seeded. This ensures that they seedlings will get light as soon as they germinate. There are many methods used for lighting. This is the most common and easiest method. Place the trays right next to the window as close as you can on a table or flat surface above the window bottom. Do not place them below the level of the window of they will not get enough light. If your table is not high enough find something to put under the legs to raise it up. Use a south or west facing window for the best light. Do not use a north facing window it will be too cold and have very poor light. If you are placing the trays narrow end to the window consider rotating them every few days so that the seeds at the back of the tray get as much light as the ones at the front. above the tray. The best systems allow you to raise and lower the lights as the seedlings grow. Putting lights well above the level of the trays is very similar to placing a tray in the center of the room rather than next to the window. Plants see light very differently than we do so what we think is bright to us is not to a plant. This of course is the best method of all, but not available to many people. If you have this luxury make sure that it stays warm enough for the seedlings but not so hot that it will fry them when the sun comes out. Greenhouse growing is a whole topic unto itself. Once your seedlings have grow to a reasonable size you can start potting them on into larger pots. Potting on next month. Author Janice Hazeldine PhDPosted on March 6, 2017 Categories Farm work thru the year, Garden work, things to doTags how to plant seeds, how to start seeds, seeding, seeding time, seeding your plants, starting seeds, time to plant seeds, when to start seedsLeave a comment on Its Time To Start Your Seeds!